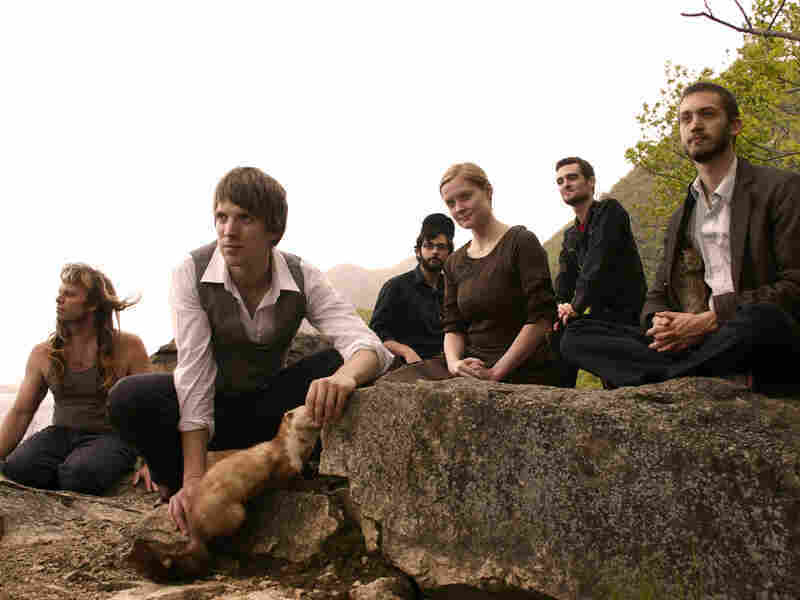 Shearwater: Grandiose And Delicate Shearwater makes epic, artful, bracing rock out of unlikely ingredients. The resulting concoctions are known to explode into bellowing catharsis, courtesy of singer Jonathan Meiburg and his crack band. But Shearwater's most blistering moments coexist nicely with the portentously brooding, fearlessly serious likes of "Hidden Lakes," from The Golden Archipelago. A lovely nature song, Shearwater's "Hidden Lakes" is as graceful and vulnerable as the world it describes. Every weekday from March 8 to March 19, Song of the Day will showcase a track by an artist playing the South by Southwest music festival. For NPR Music's full coverage of SXSW — complete with full-length concerts, studio sessions, blogs, Twitter feeds, video and more — click here. And don't miss our continuous six-and-a-half-hour playlist, The Austin 100, which features much more of the best music the festival has to offer. Shearwater makes epic, artful, bracing rock out of unlikely ingredients: Frequently embellished by handmade instruments, its songs are often fueled by, among many other things, a fascination with bird science. The resulting concoctions are known to explode into bellowing catharsis, courtesy of singer Jonathan Meiburg and his crack band. But Shearwater's most blistering moments coexist nicely with the portentously brooding, fearlessly serious likes of "Hidden Lakes," from The Golden Archipelago. Though the album that spawned it seems crafted to be consumed as a whole — Meiburg says he was influenced by the conceptual works of Peter Gabriel and Kate Bush — "Hidden Lakes" works as a freestanding morsel of piano-fueled fragility. Making the most of Meiburg's most sweetly restrained falsetto, the song paints a blurry but beautiful picture of nature in all its graceful vulnerability. The result sounds as grandiose and delicate as the world it describes.